We offer a unique set of skills and knowledge to those seeking an intelligent build. Whether you are working with an architect in the design stage, serving as your own general contractor, or are under construction with questions of quality and techniques, our consulting services assist with achieving your project's goals. Most custom builders and code departments are behind in their knowledge and enforcement of international code minimums and building science best practices. Current recommended levels of thermal performance and outdoor-air ventilation minimums are being ignored by code authorities and most builders. These issues are less about upfront costs than lack of information and reluctance to change. By consulting with us, you gain access to a world of building science research from the perspective of a builder who knows how to keep things simple and on budget. Passive-Solar-Design is one of our specialties and we often consult with architects, designers and clients on ways to optimize free heating with the sun. Land and site orientation are important in the planning stage and we help evaluate building sites for passive-solar-design potential and other important considerations like foundations, utilities, site drainage and budget concerns relating to land development. Our primary business is as custom home builders in Asheville NC. We consult with people inside and outside of our region. We evaluate designs and plans for energy-efficiency, cost to build and healthy indoor-air potential, with an eye towards quick, financial paybacks. Use our estimating to put numbers to your plans or dreams. Our consulting services are affordable, saving you time and money while increasing quality and health. A published article in Fine Homebuilding magazine's issue 254 November 2015. 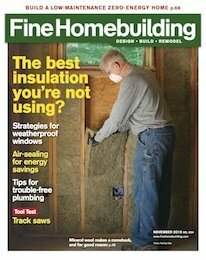 This article tackles the complicated subject of window installation, focusing on preventing water leaks and improving airtightness. 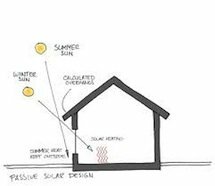 Passive Solar Design is the most efficient way to heat a home and this is the most cost-effective path for measurable performance improvement.